pull and pack orders for parcel shipment. Orders are placed one by one on the top surface of the AGV. With a full load an operator dispatches the AGV to the shipping department by pressing the start button on the control panel. The AGV follows a surface-mounted magnetic-tape guidepath to the shipping department. There, it automatically stops for manual unload. After unloading, an associate presses the start button to send the vehicle back to the warehouse. It can return empty for reloading or take incoming freight back to the warehouse or other points in the facility on the return trip. The installation of the Creform AGV system eliminates the need for manual delivery of packed orders to the shipping department and increases productivity in the warehouse. The time it takes to make a delivery is predictable, critical to any material-handling operation. The low initial investment and non-interruptive installation procedures (no modification of flooring) allow any AGV user to create a basic or elaborate custom-designed structure and conduct logistics operations economically with one vehicle. 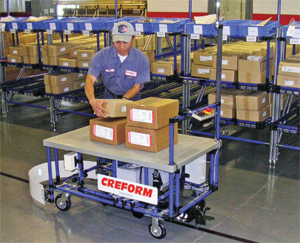 The AGV is a rectangular-frame cart with a platform surface attached to the top. The drive system mounts on the bottom, along with heavy-duty casters on each corner. Within the framework is the power supply-two 12-V deep-cycle batteries. Load capacity: 1000 lb. The AGV’s spring-loaded drive wheel ensures constant contact with floor surfaces, allowing for travel over variable surface materials and conditions. A simple mechanism allows personnel to raise or lower the drive wheel—in the raised position, the automated cart becomes a maneuverable push cart for travel to off-guidepath destinations.